Entries to validate your visa You will be required to validate your visa. This may mean that you have to visit Australia twice - once to validate the visa, and once to actually take up residence. The initial entry for validation will normally be required within 3 to 5 months after your visa has been granted. You can remain in Australia when you make your first entry, or you can depart Australia and take up residency at a later stage. of household goods The contents of a standard three-bedroom house should fit into a 20-foot container. The costs of packing, shipping and clearing the container in Australia vary considerably from country to country and should be somewhere between $ 5000 and $10,000. If you decide to use a Migration Agent to guide and manage your Visa Application, you need to add to the above the cost of obtaining these professional services. The MARA web site has a page with an overview of what Migration Agents in Australia currently charge for managing applications for the various visa classes. The Consultancy Fee charged by AMES for its services is broadly in line with those set out on the MARA website and, as indicated there, our fee will vary depending on the type of visa involved. one-third when your Visa Application is complete and ready for lodgement with the Department of Immigration and Citizenship. 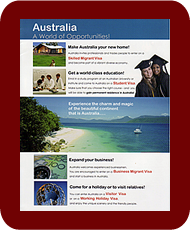 lodge your Visa Application with the Department of Immigration abd Citizenship. monitor the progress of your Visa Application through the Department. AUD$ 8,500 to 15,000, if you apply under the Business Migration Program.